"Granulation" provides a complete and comprehensive introduction on the state-of-the-art of granulation and how it can be applied both in an academic context and from an industrial perspective. Along with coupling science and engineering practices, it covers differing length scales from the sub-granule level through behaviour through single granules, to bulk granule behaviour and equipment design. With special focus on a wide range of industrially relevant areas from fertilizer production, through to pharmaceuticals. Experimental data is complemented by mathematical modelling in this emerging field, allowing for a greater understanding of the basis of particle products and this important industry sector. 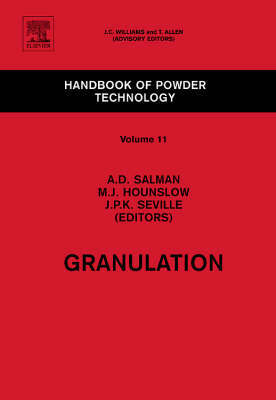 Four themes run through the book: the Macro Scale processing for Granulation including up to date descriptions of the methods used for granulation and how they come about and how to monitor on-line these changes; the Applications of granulation from an industrial perspective, with current descriptive roles and how they are undertaken with relevance to industry, and effective properties; mechanistic descriptions of granulation and the different rate processes occurring within the granulator. This includes methods of modelling the process using Population Balance Equations, and Multi-level Computational Fluid Dynamics Models; and, the Micro Scale: Granules and Smaller, looking at single granules and there interactions and modelling, while also considering the structure of granules and their constituent liquid bridges.